Our high pressure fittings are rated up to 350 bar (5000 psi) with fingertight nuts, well beyond the burst strength of most PEEK tubing. These fittings are manufactured from high quality inert polymers to exacting tolerances. 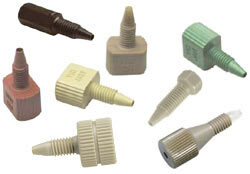 Color-It fingertight adapters fit all our PEEK and stainless hex-head nuts for 1/16" tubing.